Its almost like a spring day. In the sixties with mild rain falling. The wind was kicking up, so coming back from taking K and A to school gave me carpets of red and gold coating the street...magical the way unbroken snow is in the winter, with leaves falling, tumbling and continuing to build the thick carpet of color. Am mulling over all sorts of stuff from pictures to ideas. I need to create some "go to" images when I get stuck which are just therapeutic to draw. I need to start creating some heart images, valentines and love related stuff as I want to send a 16 pp. Lulu book to my clients and people I love for Valentines--so making some images as we go will help me accomplish that. The other option is to do a little folded piece with the images on each folded panel. I think I could do that through Ofoto as they have a folded image option that I could just send scans unstead of family pictures to do the same thing for about a buck and a half a piece. I also think I just need a length of time to pencil in more of the book as thumbnails to get the wheels turning...versus the near standstill position they are in now. Just too much on the plate with my work as a designer. Did a bit of looking at Edward Hicks(1780-1849) I love Hicks as he was raised and apprenticed as a carriage maker in the Philadelphia area. One of my ancestors, a Mr. Quarrier, was a carriage maker in Philadelphia as well--so somewhere in my irrational way, I have adopted Hicks as one of my own. Not, but hey, fantasy is a wonderful thing. 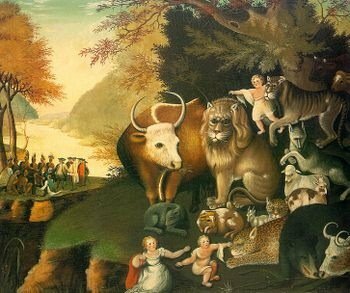 Anyway, Hicks was bitten by the painting bug and was able to reconcile his interest in painting with his religious beliefs and practice as a Quaker, becoming a Quaker minister and painter. 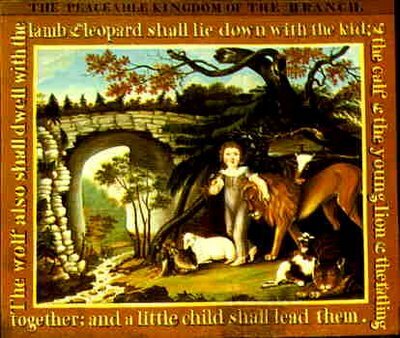 His view of Pennsylvania and it's wilderness, its native people and of course the animals that do not live in PA (Lions, for instance) and how he packs them all together--never tiring of his peaceable kingdom theme that he kept bringing into many of his pictures. At first his fellow Quakers looked a bit askance at his profession, and because of this, at one time he gave It up to be a farmer. He was unsuccessful at farming, however, and returned to his brushes. It was honest work, so fellow members of his meeting eventually forgave him, especially since he was becoming a strong preacher, traveling among many meetings. He did agree with them about certain vanities in art and refused to paint portraits, which were too ego-centered. He worked at the time when both the United States and modern American Quakerism were young. His spiritual beliefs came from Barclay and 18th-century quietism, which espoused simplicity, self-discipline, and contact with the Inner Light. FIias Hicks, his second cousin, was a central figure in a religious storm. Ed- ward Hicks was a spokesman, in word and in image, for those who became known as the Hicksites. It broke his heart to see Quakers becoming worldly, with excessive material goods and inflated pride, and leaning towards the creation of a spiritual elite. He felt this corrosion also in the authoritarian control of elders, as mere men, and not as followers of the Inner Spirit of Christ. He had a genuine feeling for the Scriptures, along with hope for a continuing sense of insight open to all. Some of the divisions between urban and rural Quakers have been laid at the feet of visiting Quakers from England, justly or unjustly. In his travels, Hicks spoke much of this. So, I need to kindle my inner light and move forward in this grey, rain filled day.